Reduces flare and ghosting This new medium telephoto macro lens employs a new design concept for digital SLR cameras. Its new lens power layout produces an excellent optical performance and also reduces flare and ghosting. This new lens is designed to reduce the influence of harmful light caused by reflections from the digital image sensor. An easy to use 105mm medium telephoto lens MACRO 105mm F2.8 EX DG lens is very suitable for taking pictures of nature and it enables to use of natural light conditions or flash. The greater working distance of this lens is very advantageous when taking the picture of an insect or a flower among branches. The narrow angle of view is a great aid for simplifying backgrounds and shallow depth of field makes it easier to handle the composition. 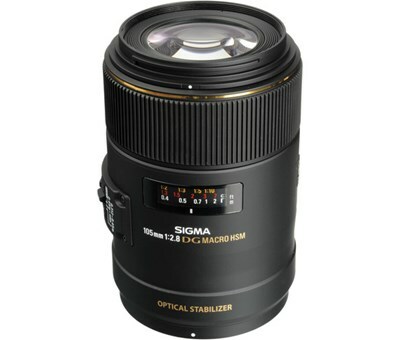 This lens would have an equivalent field of view of a 178mm telephoto macro lens on a digital SLR camera (when used with the SD10). Minimum aperture of F45 Depth of field of medium telephoto macro lenses is generally very shallow; however, Sigma, Canon and Konica Minolta mounts of this lens have a minimum aperture of F45 (or F32 for Nikon and Pentax mounts) for incredible depth of field. Screw-in lens hood A screw-in hood is included, for convenient use of circular polarizing filters. It is possible to attach an 77mm filter in front of the lens hood. Dual Focus (DF) system This lens also incorporates a Dual Focus (DF) system that is designed to make the lens easy to hold during auto focusing. The large focus ring offers smooth and positive action whilst focusing manually.